SquashLevels is the ranking system for all squash players. It collects results from a large number of league, tournament and box systems and calculates the level each player is playing at for every match. It covers all abilities from complete beginner right up to the very top players in the world. Once you know your level you'll always be able to answer that fateful question - how good are you? You'll know which box to play in, which team to play for, wherever you choose to play. You can find combined player histories, level charts and stats for all players on the system. You can even enter your own results. If you play squash you should be on here - you probably already are! It's the next big thing in Squash. Results are pulled from a large number of source systems; league, tournament, club boxes etc. This number is growing all the time allowing a player to have all his/her results consolidated on the same system. It learns and retains information about the players from the source systems. For instance it may pick up an age group from one, their England Squash membership number from another and even a name change. This ensures player information is kept up to date automatically. It covers all abilities from the complete beginner to the top professionals. The levels it assigns to players are relative and meaningful so that if a player is twice as good another player then they will have twice the level. The levels are accurate enough that you can make result predictions or calculate handicaps. Players are provided personal histories, level charts, performance statistics and trends. It weights results based on their importance. A box game has much less effect than a tournament match for instance. It automatically identifies pools of players and auto-calibrates between them. This is very important to ensure that levels are consistent across leagues, counties, clubs and even countries. It automatically assigns a starting level based on the first and subsequent results. No need to manually assess hundreds or even thousands of players. Competitions can be run across the country such as 'Most improved player' which helps identify up and coming players. With so much data from so many players and matches, the system can provide live participation metrics at the club, county and even country level. There are very few ranking systems that do any of these, let alone all of them. SquashLevels is the most comprehensive ranking system available. A player's level is a number that represents how good they are. For example, if a player has a level of 2000 then they are twice as likely to win a rally against an opponent with a level of 1000 - on average. In this case, for every 3 rallies, the 2000 level player will typically win 2 and the 1000 level player will win 1, on average. Same applies for 4000 versus 2000. There's no analysis into how good they are at drops, lengths or if they've got a bad knee - just that they will win twice as many rallies. Note this is based on rallies rather than points which is where the English scoring system complicates things a bit but, don't worry, SquashLevels can spot English scoring and take account of it. Levels are calculated as a relative measure between players but with the large number of players we have in the system and the spread between complete beginners and the best in the world we do actually know enough to make sweeping statements about how good a player is based on their absolute level. 80,000 - world number one! The SquashLevels system generates ordered lists of players based on their level so it is similar to the rankings but it is also different. The official rankings use a points system that is based on how far you progress through a tournament; the further you progress the more points you get, the more prestigious the tournament, the more points are available. These points are averaged over the last 12 months and managed by the appropriate bodies such as the PSA whereas SquashLevels are based on recent results and provide a number (i.e. level) for how well someone is playing 'at the moment'. In both cases, the top players are at the top but player levels show how well someone is playing at the moment. They are a good indicator of what the rankings will show in the future. SquashLevels will give you a level as long as you have a result whereas you have to get through at least the qualifiers of a professional tournament to get a ranking. As a result, the top of the rankings are very accurate but the lower down you go it becomes less so as you have a mixture of players who only play some tournaments or who never make it past the first round. You will not have a ranking at all unless you enter one of these tournaments which excludes 95% of the people who play. SquashLevels is fully inclusive. Rankings are focused on specific categories and not mixed so it's not possible to compare men with women, juniors with seniors or across any of the age categories. With player levels, everyone is measured against the same scale so can be compared. It's interesting to see Nicol David's level for instance - where would she stand in the men's rankings? Ranking lists tend to be quite short once you stop looking internationally. In the UK there are not that many ranking events for seniors so there isn't really a ranking for England players. Although SquashLevels is not averaged over 12 months it can be used see who all the England players are and what order are they in at the moment (or other time which you can select). The matrix system is similar to the player levels system but it uses a points value rather than a level. As with the levels system, your points value goes up if you do better than expected and it goes down if you do worse. The matrix system gives you an order for players and a good idea of who is better than who but it doesn't really give you a number that tells you how good a player is in absolute terms or something that you can predict results with. The player level calculations take a large number of factors into account (see below) to control the amount of adjustment after a match. This increases the accuracy of the level. The player level calculations take the points scores into account as well as the game scores as this is particularly important for 3-0 results. There's a big difference between 9-7, 9-6, 10-8 and 9-1, 9-3, 9-2. Around 2:1 in fact. The matrix system tends to quite harsh if you lose matches and even if you lose, say 3-1, to a better player (which might be expected) you can still drop a few points and not get the benefit of the game won let alone the points scored. The matrix system tends to cap the very top and bottom players because their results can only be a few points different from their opponents. The middle order does give a good feel for ablility. Although the exact points changes between the matrix system and the levels algorithm are a little different, it is still possible to create a mapping from level to matrix to give a good idea where a player might be listed in a matrix system and this mapping is shown in the SquashLevels system for interest and comparison. The Squash Skills Tencap assignments are done based on specific events and tournaments so will only cover a subset of players but it's always good to have a numeric assessment and by mapping from levels to Tencap it allows all players to know which Tencap division they are in. When two players play a match they both have a starting level and dividing one by the other gives you the expected result ratio. For instance, a level 1200 player playing a level 1000 player gives an expected result ratio of 1.2. The actual result is used to generate the actual result ratio and this is based on a combination of the games scores (e.g. 3-1) and the points scores (e.g. 9-4, 9-7, 6-9, 9-5 - which adds up to 33-25). This isn't a straight forward conversion mathematically because of the complexities of the English scoring system but we overcame that by simulating ten million games of squash from varying starting ratios and then generating a table we could use to look up. This allows us to take the games result (3-1) and match result (33-25) and work back to a result ratio very quickly and then compare with the expected ratio which is what we started with. If the difference in player levels is > 3:1 and that is backed up by the result then the levels are not adjusted. It's just too extreme to be accurate. If the difference in player levels is > 1.5:1 then it's likely that the better player isn't trying his/her absolute best but their opponent probably is. The system applies an 'effective effort' factor (it's applied gradually) to the better player's level before the calculations are done. This is especially useful for the summer league when there are quite often mismatches in abilities and we don't want to penalise the better players for not hammering their weaker opponents. Players with a lower level can adjust faster than those with a higher level. This is really aimed at the juniors who can cause havoc in these systems as they tend to improve very quickly and often only play a few 'officially competitive' matches each year (e.g. the local junior tournaments). We need a junior's level to keep pace with their actual ability and, at the same time, we don't want them to 'take' too much level from their opponents. We've put a lot of work into levels for juniors. If a player hasn't played for a while or they are new to the system, the confidence in that player's level is reduced. This allows these players' levels to move more quickly than a player with recent history and, hopefully, get them to the right level in just a few matches without impacting their opponents along the way. You can select 'show confidence' in some of the screens to see what your level confidence is. An unexpected result also drops a player's level confidence. This allows them to return to 'normal' more quickly in the same way. Long term analysis has shown that over time the average level is dropping! This is believed to be because players come in at a lower level than they leave at which point their level is not included in the average. SquashLevels are exothermic! It's 1-2% per year but that adds up over time. To allow for that, the average level for all active players is fixed and small adjustments made as needed. Without that, everyone's level will fall gradually over time even if they remain at the same ability. Here's the graph for the points ratio and games ratio for english scoring. The games line flattens out pretty quickly after a relative ability of 1.5 whereas the points line keeps going. This shows, at this end of the graph, the points ratio is probably a better measure otherwise we loose differentiation. You've got to be really good to stop the other guy getting any points at all! With 3-0 wins, the points ratio becomes a bigger factor as the score gets closer to 27-0. The player level algorithm has been in use for quite a few years now and, with the allowances for the many conditions listed above, we have a system that is remarkably accurate. We have compared the top 100 in the world with the official rankings and they are not that dissimilar despite the rankings being averaged over a much longer period. It is certainly true that the better players are at the top and, in fact, quite often, the level system turns out to be a good predictor for what will happen in the official rankings because of the delays between the two. We quite often have duplicate players entered, say because they have played in multiple clubs or multiple counties but the levels of these, apparently different players, are usually very similar. Sometimes players get injured and their level drops but then recovers to their previous level once they start playing competitively again. From playing another player who already has their level set. This is the most common method and is accurate as long as that match is representative - which is true for most cases. Sometimes, however, a player's first match gives an unexpected result and that can leave their initial level inacurrate. If that happens then one of the other methods below can be used. A registered player can propose a starting level. If a player only has a few results and their opponents don't have levels either (they may be an independent set of players) then they can propose a starting point based on the absolute values outlined on this page. That will get them going but once the system has other results coming in that confirm/disagree with that starting level then it may be overridden later. The club captain can override it. By setting the mode to 'manual' and providing a value in the edit player screen, the club captain can force the system to use a specific starting level. The club captains usually have a good idea of how good their players are but this is not a recommended method unless the above two have failed. If neither player has a level set the they will both initially be recorded as 'new' but their results will be held in the database and when one of the two players does play someone with an assigned level, the algorithm will work back and assign them an absolute level. As long as one player has a level, then everyone they play, or their opponents play and so on, will also have a level. If county levels need adjusting this is done by adjusting the starting levels of all the players in that county. This tends to happen in the early days of a new county coming on board and it's done by tracking players as they move from county to county. If the levels of a county seem a bit low, then they are raised very slightly during the nightly processing and this happens every night until they even out. This usually only takes a week or two but small changes can be made any time if the counties appear to drift. This is a fully calibrated and controlled system. Where do the results come from? Any system can connect to SquashLevels allowing results to be retrieved or sent across automatically. We just need to work with the developer of that system to agree the access method and format of the data and we're ready to go. For the systems connected so far, it has taken typically a couple of hours for the developer to add the functionality. It really is that simple! For every registered system, results are retrieved or received every night at around 4am and then the levels recalculated. Note that all matches are recalculated from the beginning to allow for old matches being entered later on. Note that during initial set-up, all the results from a system can be transfered across so even if you connect for the first time in the middle of a season, we can pull every available result in (i.e. back to when the local league system was first used) and go from there. You should have access to your entire recorded match history. The only essential requirement is that the source system provides a unique ID for each player. Duplicate IDs we can deal with but having more than one player share the same ID is a problem (though we can deal with that too if need be). Players who are registered can also enter their own results on-line directly into the SquashLevels system. Note that if a player enters a number of matches and then at some point in the future their local system is automated so that the same matches are now sent across automatically, the SquashLevels system will detect this and only unique matches will be recorded. Which matches can be included? Which players can be included? The whole point of the player level algorithm and the SquashLevels system is include all players from beginner all the way up to the top professional. It applies the level algorithm consistently across all age groups and for men and women. How long is it before my level is accurate? The players were reasonably matched - i.e. anything from around 9-3 for a game score provides good accuracy. 9-1 is getting a bit extreme. Their opponent had an accurate level. A player's first level has low confidence which allows it to adjust faster than their opponent with high confidence. This speeds up the process of getting an accurate level without having too much impact on their opponents. After a few matches, the system can tell if the initial level was accurate and, if not, it will automatically update that initial level to a more appropriate value. This allows the player's full history to be accurate once the first few results are in and the player is calibrated. When a player first registers they are able to set their own starting level, based on guidelines, if their first opponent doesn't have one. This level will still be overridden by the system at some point if it proved to be inaccurate. So, to answer the question, most players using the system correctly will have an accurate level within one or two matches whereas those who start in the wrong place may take anything up to 10 matches to be re-adjusted back to reality. Are all match results considered equal? The simple answer is 'no'. For instance, a box game is not as important as a league match and a league match is not as important as a tournament final but we can't arbitrarily increase a player's level just because they're playing in a tournament. So what we do is give a higher weigthing (i.e. less damping) for the more important matches and a lower weigthing (i.e. more damping) for the less important matches. Specific events or match types can have their weighting set independently by the admins but in most cases; events and tournament matches have full (100%) weighting, league matches have 75% weighting and box matches have 50% weighting. Note that this is in addition to the damping that is already applied to all match results. This still ensures that a player's level is accurately represented on the system but it's more focused on recent results for, say, a tournament. This means that if you list the players at the end of a tournament then their levels will reflect how they played at the tournament rather than how they got on in the box match before the tournament. What information can I get from the SquashLevels website? The levels of everyone else on the system from beginners through to the professionals. This is quite interesting to watch a PSL match, for instance, actually knowing how well each player is playing at the time. Show the player levels after events/tournaments. Just click on the event/tournament link in the player listings and the system will show the players and their levels at the end of the tournament. Note that this does not necessarily tie up with the final order of the tournament winners as players can lose an early round and then play much better in the plate. This is also true of Monrad events. You can see what your expected result is against any opponent. Just enter your level and their level and see what the score is expected to be. Shows for english and PAR scoring and even gives a starting point for a handicap match. Please remember this is expectation based on simulation based on you both playing your best! With so many players and results on the system it's important that individuals, clubs and counties can have it set up so that it's focused on them and their needs. This can always be done using the player listing filters and then manually setting up preferred default views but we also provide county focused starting points. It's just a matter of adding the user_mode parameter to the player listing web page which tells the system to set it's defaults for that county. They can be overridden at any time - it's just a starting point which is stored in a cookie. The league system can then link to SquashLevels using this parameter so that it's users see the county view they want by default. If need be, we can agree specific county defaults. Get your county affiliated - that way all league matches and, potentially, county tournaments will all be automatically transferred across. If your league matches are not currently being recorded then it might be worth talking to your county committee. It's not expensive for basic affiliation and not that hard to do technically. Get your club affiliated. Same as for counties. 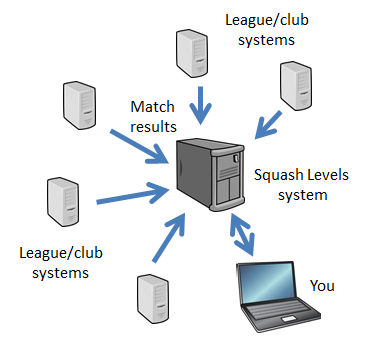 Affiliated clubs are likely to include box games which allows the non-league players to be part of SquashLevels. Clubs and counties cover different matches so, really, they both need to be affiliated to cover all your matches. Register and enter them in on-line. If you're registered then you'll be able to enter all your own matches so that will give a level to you and your opponents but... unless your opponents are registered they will not be able enter their results against each other and you won't see much progress over time. If you play in the professional tournaments your results will already be being transferred across. What if I can't remember the points scores? Entering the points scores for a result gives the system the best chance for an accurate assessment of level but if you only have game scores it will still work. The extremes are limited so ratios higher than 1.5:1 will have limited effect. Close matches (3-1, 3-2) aren't affected so much by not having the points scores though the level adjustments are still reduced slightly. Can I enter results via my phone? As SquashLevels holds the results for thousands of players from many counties and even countries, there is a set of filters at the top of the player listings that allows you to select the players you're interested in. Clubs. Either all clubs or a specific club. If a specific county has been selected then only clubs from that county are shown to keep the list manageable. Counties. Either all counties or a specific county. Note that this will include professional players who are affiliated to that county even if they don't play in the county leagues. Events. If shown, this allows you to select the minimum number of events that a player has played in for them to be listed. Note that a full league only counts as one event. This is really intended for the pro players who compete in anything up to 18 events/year. Period. Will default to all players who have played in the last 12 months but can be extended back in time if you are registered. Leagues/events. These are the leagues or events such as tournaments and it's a very long list if all players are shown. This is automatically restricted to leagues and events specific to the county if a specific county is chosen. Category. Tick this box if you want to see the player category - which is whether they are Pro, Senior or an age group. Search name. Enter a name or part name(s) here to search for a particular player. You can show all 'Smiths', for instance, by entering 'Smith' and clicking on 'Show'. Note that the minimum level confidence is overridden for this selection and even players with a poor level confidence are shown. This way, if the player is on the system, you should be able to find him/her. Note that the name search is still restricted to the period selected. If a player has not played in the last 12 months and that is the period selected then they will not be found. Once you have selected the filters you are interested in, you can set that to be your default view by clicking on the word default in the line below the filters. Note that only players with sufficient level confidence are shown by default as players with rogue levels can disrupt the player lists. These players can be found if you search for them by name. Provide an email address and password to create an account. Tell us your name - by identifying one of the players on the system as you, by adding yourself as a new player or by telling us that you're not a player. If you are a player we need you to confirm which club you play at and whether you are male or female. We don't hold any personal information. Start your free, trial membership or pay for full membership (after the trial has completed). During the three month trial period you will have full access to all the pages, features, personal results entry and information in the system, after which, you can either pay the registration fee (£5 for the year) to continue with the same level of access or return to basic access. If you choose to remain a basic member, the system will still remember your details and allow you to become a full member at any time in the future. It's not a huge amount of money - we're just trying to cover costs. See results going back further than 6 months - for everyone, not just you. Find out who are the most improved players within your club, county and country over different periods of time. Find out who has been the best player over time in your club, county, country or the whole world. Is Rami Ashour the best player of all time? How would the best player in your club now fair against the best player from a few years ago? Easy filtering (focused on you) to find your position within your club, county and even country. See ordered player level lists (i.e. level based rankings) at any specific date going back in time. Detailed explanations on the level calculation after each result. See the confidence of your level. Report duplicate players - if you notice a player recorded twice (you or someone else) you can report that back and have them merged. Update your own information such as age group, country etc. Automatically received results only contain a subset of player information so it is useful to be able to complete that online. Club and county results don't usually contain country information so if you want to be included in your country list then adding your country will allow that. Note that the only personal information held on the system is your email address and that is not available or visible to anyone else except the system admin. Use the on-line forum to bring up topics for discussion or comment or reply to topics raised by others. Forum articles and replies are automatically emailed to those who have signed up. If your county or club results are being transferred to the SquashLevels system you may still only have access to your basic level history depending on the membership agreed with the county or club. In this case you may still like to register as an individual for access to all the other information (above). At least you won't have to enter your results unless there are specific challenge matches you want to record. Are there different levels of registration? No. Registration is extremely cheap so there's no point in dividing it into different levels of functionality. If you are registered then you have access to everything, if you are not, you are limited to the basic view - though that is still quite a lot. You will always be able to find out your level, or the level of any other player without registering as long as the results are on the system. Counties and clubs can also choose to register all their players so they have full access but that is not common as, although it's a small amount per player, it still adds up for a whole county. How do I find out about changes/updates? The SquashLevels system is actively maintained and features are being added all the time. The goal is to provide such a rich set of features that everyone will want to register so do keep checking back for updates which will be posted on the SquashLevels Facebook page if you 'like' us on Facebook you will get the latest updates. We also post updates under About->News. If you have suggestions do please get in touch. What should I do if my level appears wrong? Please report any levels that appear wrong - whether yours or someone else's. This does happen from time to time if results are entered incorrectly or perhaps a game has continued with one player being injured. One rogue result can affect the results of others for a while so it is important to identify them and exclude them from the calculations. Although the system is quite good at spotting unexpected results, there's nothing like local knowledge of how good players really are to identify inaccuracies. Anything that's wrong in the system can be corrected, bypassed or removed if need be so it's just a matter of reporting back to us and maybe working with us to understand what's gone wrong. It's through doing this over several years that has allowed us to fine tune the many cases we now allow for. There may be others yet to uncover as the system scales up. Your help is much appreciated! My name is spelt wrong. How do I fix that? If you are registered, you can correct any of your own details from name to age group and even starting level. If you are not registered then please report anything that needs changing back to the system admin. I'm injured. What will happen to my level? When you are fit and back to your previous standard, your level will return fairly quickly - Usually around 2-3 matches. The confidence in your level will drop (both through time not playing and also from the unexpected result of your last match) and that will allow for a faster return to normal afterwards. If a specific match result should be excluded because, say, the injury occurred in the first game but the results were entered as if the match had continued (e.g. 9-6, 9-0, 9-0) as can happen in league systems, then that result can be excluded from the nightly level processing. Please let us know if this is the case. Don't just do this because you had a bad result! We can spot the difference between that and a genuine match stoppage. What's to stop people abusing the website? The levels algorithm is dependent on the accurate recording of truly competitive matches. Incorrect results have a negative impact on the levels of their opponents which then ripples through the system so it is important that only accurate results for truly competitive matches are entered. Most results come from official and automated sources - they are 100% trustworthy but results entered by individuals could potentially cause trouble so they are checked for unusual results which are then flagged to the administrator. These are then queried back with the person that entered them (we have their email address) and the results excluded from the level calculations at which point they can be corrected or removed. It is very rare for players of county standard and above to not already be covered by the official tournaments, all of which are already on the system so entering a level too high or having suspiciously good results against top players is easy to spot and highlighted by the system. Players abusing the system will be removed. What if I play for more than one county or club? It's possible that players can be entered more than once in the system if their results come from more than one source. The system is usually able to recognise this because it can identify multiple players of the same name with the same level but the merging of these players is still done manually in case they really are different people. This manual merging is done by the system admin but usually only after it has been confirmed that the two entries are for the same player. It's hard to separate an incorrectly merged player. Once the system is told that these 'two' player names are the same player then it will treat all results for either player as one. I.e. once the names are merged, the system will continue to merge the results going forward automatically. A player from two sources doesn't always have the same name - it is remarkably common to find different abbreviations for instance Jonathan Smith and Jon Smith could be the same player but, then again, maybe not. This is where we need the support of local players to help confirm duplicates. Is the player level algorithm open source? No, it isn't. Though a good deal of it is explained on this page and it can be reverse engineered from the level calculation breakdown from player results it is copyright. See the copyright notice at the bottom of this page. If you want to make use of the player levels algorithm them please just register and make use of the SquashLevels system itself. It's not expensive. Note that the algorithm is only half of what you need - you also need all the results. It's a bit like a phone system - the more people who have phones, the more useful the system!